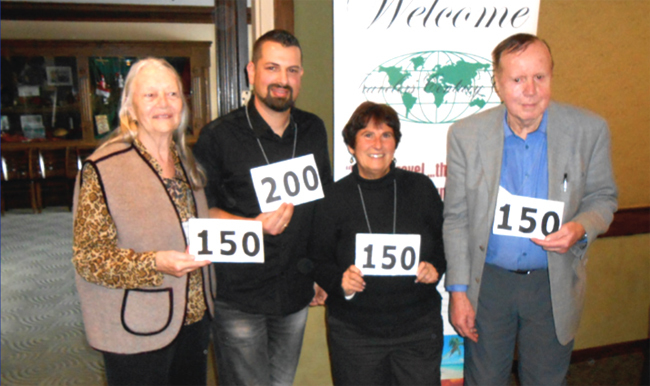 Northern California chapter members reach travel milestones. From left to right: Betty Matthews, Samer Kawar, Maria Barsotti, and Fred Omenzetter. Fifty-six members and guests of the Northern California chapter met on March 3 at the Basque Cultural Center in South San Francisco. We began our luncheon by congratulating the club’s new president, JoAnn Schwartz. JoAnn has been a long-time member of our chapter. We also congratulated four members who reached traveling milestones. Margo Bart gave an outstanding presentation on the countries of Eastern Europe, as well as the territories of Srpska and Transnistria. Texas TCC member Nick Bowles will give a talk on the Northwest Passage for our June 2 meeting.